Prices of goods and services in Singapore may be rising at a slower pace, but Singaporeans still feel the squeeze, convinced that the cost of living is rising faster. In tackling the issue yesterday, Minister for Trade and Industry Chan Chun Sing said in Parliament that cost of living is not a one-dimensional subject about price changes. People's aspirations, and their ability to fulfil them, can also affect their perception of the issue, Mr Chan explained. Still, he acknowledged their concerns, saying "we recognise Singaporeans' evolving aspirations for a better life for themselves and their families, and the associated stress of achieving real income growth in a volatile economic environment". He assured Singaporeans that the Government is committed to helping mitigate the situation. "Beyond creating opportunities for Singaporeans to enjoy real wage growth to meet their aspirations, the Government is also committed to helping Singaporeans stretch their hard-earned dollar," he said in reply to Mr Liang Eng Hwa (Holland-Bukit Timah GRC), who had asked whether the cost of living has increased significantly. The issue has gained traction in recent months as electricity tariffs rose and an earlier announced increase in water prices kicked in. But looking at absolute measures, overall inflation in Singapore has, in fact, declined between 2012 and last year compared with the five-year period before it, said Mr Chan. The Consumer Price Index - which captures price changes - for all items rose 0.6 per cent a year on average for the past five years. This was lower than the average increase of 4 per cent between 2007 and 2012. The figure is likely to remain low this year, with overall inflation expected to be between 0.5 per cent and 1 per cent, said Mr Chan. But he gave a word of caution, saying that rising global oil prices is expected to increase fuel costs and electricity prices. However, he foresees any potential consumer price rise to be moderate alongside a faster pace of wage growth and improvements in the labour market. Yet, "no single measure will express an individual's 'cost of living' pressures fully, given the different needs and wants, the evolving aspirations and the potential gap between aspirations and anticipated means", he said. Other factors also affect perceptions of living costs, including an evolving interpretation of what are essential goods and services for different groups, noted Mr Chan. He also cited the rise in prices of daily items - for example, water and transport fares - that may have a disproportionate psychological impact on consumers, even if the increases are not the biggest in absolute terms. He outlined the Government's eight strategies in managing the "pressure points" which spark worries over costs of living. They include keeping the economy competitive, diversifying sources of supply for goods, focusing on giving help to those with less and working with social enterprises. Acknowledging that Singaporeans in other income groups too hope for help in areas like education and housing, he said this is already being done, although the amount of subsidies or assistance is tiered based on people's needs. While this is politically more difficult, it is the economically and socially sound thing to do, he said. Giving the same help to everyone without discrimination "also cannot be the wisest way to expend our finite resources to help those who need more", he said. "Ultimately, we must forge a social consensus on how much we want to tax the general public, to support the desired groups in a targeted manner." Several MPs raised concerns about the cost of living in Parliament yesterday. Minister for Trade and Industry Chan Chun Sing responded. Liang Eng Hwa (Holland-Bukit Timah GRC): What else can the Government do to help the sandwiched middle class? Answer: For many middle-income people, their concerns will be the education of their children and, perhaps, their utility bills. Many will be taking care of their elderly parents as well. First, we try to do as much as we can to take care of our seniors, to help middle-income households with elderly parents. Second, we want to make sure children's education remains affordable and everyone has similar opportunities to excel and fulfil their potential. We will pay particular attention to the group with lower wage increases or stagnating wages because their industries are going through rapid transformation. This is where we will work closely with the Ministry of Manpower and NTUC to help our workers transit to new industries, acquire new skills and take on new jobs before they are displaced. Lee Bee Wah (Nee Soon GRC): Nowadays, prices of goods sold at NTUC FairPrice supermarkets are not necessarily the cheapest. Will the minister look into this? 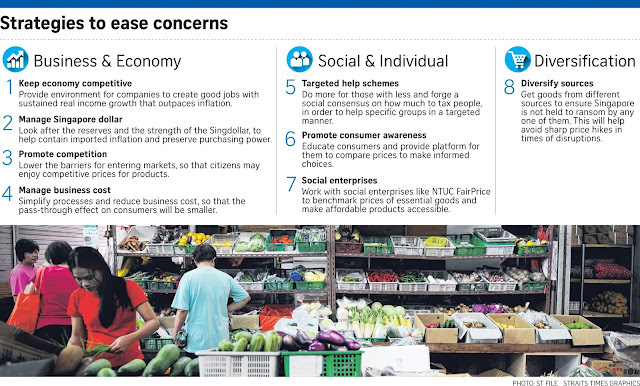 Answer: NTUC FairPrice has a basket of 500 items whose prices it monitors daily against those in the market. It will make sure that, on average, its 500 items will be 4 to 5 per cent less. But that doesn't mean every item is 4 to 5 per cent below the market price... One question I have always pondered is not whether Sheng Siong or Dairy Farm is able to meet NTUC (FairPrice) prices and beat NTUC (FairPrice) prices. It is, if we didn't have social enterprises to benchmark some of these things, would the competitors still charge those prices? Leon Perera (Non-Constituency MP): Would the Ministry of Trade and Industry (MTI) consider measuring and publishing the Consumer Price Index based on different demographic groups... for example, young couples, parents with young children and retirees? Answer: We have different ways of looking at the data. One dimension would be by income... Another is, for example, retirees, because they generally have either fixed or no income and they are living on their savings. We are particularly concerned about (this group). That is why in the last five years, MTI has started monitoring this data. But it takes time to build up different demographic groups, and we will make available the data when we have them. Saktiandi Supaat (Bishan-Toa Payoh GRC): What will be the impact of a rise in the US Federal Reserve interest rate, especially on Singaporeans? But the most important impact of any interest rate hike across the world is the impact on global business confidence. If the trade wars and interest rate hike lead to an overall dampening of the global confidence level and people's investment, then what affects us most severely is job creation. If we cannot continue to create good jobs for our people, all the other help schemes are secondary because, first and foremost, we must have good jobs for our people and grow our economy, and we have the means to help each other by redistributing some of the gains from this entire economic system. A parliamentary question on whether the cost of living has become a cause for concern was allowed a longer than usual run during the 90-minute question time yesterday, as MPs tackled a hot political issue that has gained attention on the ground, especially after electricity and water prices rose significantly this month. Speaker of Parliament Tan Chuan-Jin called, no fewer than eight times, on MPs who wanted to speak, giving them a chance to have a meaningful exchange with Mr Chan Chun Sing, the Minister for Trade and Industry. This is in contrast to most other questions, where the norm is to have two or three supplementary queries raised. The Speaker has said previously that he will allow longer debate on issues of greater interest to the public - a shrewd balance between ensuring that more questions can be answered in the fixed time allotted for it, and having the political sense to know which questions should be exceptions. In his response to MPs, Mr Chan pointed out that wages have, in general, outgrown prices. But price increases on some items may be psychologically more impactful than others - coffee, for example - because one might buy it daily. Others may feel squeezed because they may have aspirations which they feel cannot be fulfilled by their earning potential. 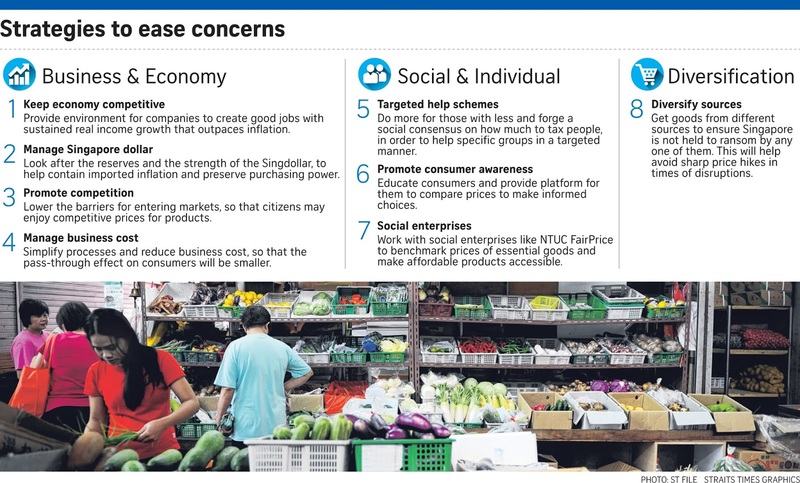 Mr Chan said the cost of living issue is tackled using an eight-pronged strategy:Ensuring Singaporeans have good jobs and rising wages, an exchange rate stance that seeks to control imported inflation, diversifying the sources of goods supplied to Singapore, keeping the market competitive, managing business costs, targeting help at those who need it, enhancing market transparency so consumers have choices, and working with social enterprises like NTUC FairPrice. Two points he made stood out for being relatively new. They also appear to represent a continuing evolution in the Government's thinking on the issue. First, when citing numbers on inflation, other than giving the overall inflation figure, and figures for three income bands - the bottom 20 per cent, middle 60 per cent and top 20 per cent - Mr Chan also revealed the inflation rate for retiree households. This was 2.1 per cent last year (after excluding imputed rent for owner-occupied homes) - higher than inflation for the three income bands, which ranged between 1.7 per cent and 1.8 per cent. Mr Chan said inflation is a bigger problem for retirees "because they generally have either fixed or no income and they are living on their savings". He added that the Government is doing more for this group through help schemes like the Pioneer Generation Package and transport subsidies. His citing of the retiree households inflation figure is notable. Unlike the overall and income-banded inflation figures, this figure is not publicly available. It seems to signal a different approach by Mr Chan, who took over as Trade and Industry Minister in May. He said yesterday: "The Government is concerned not just with the lower income. That is the reason why I have asked MTI and the various agencies to look across the entire spectrum of families in Singapore - retirees, middle-income groups - because they all face different pressures." Asked by Non-Constituency MP Leon Perera of the Workers' Party if inflation for various demographic groups can be published, Mr Chan said "it takes us some time to build up ( data) by different demographic groups, and we will make available those data when we have them". As Singapore becomes more diverse in socio-economic terms, there is a need for important indicators like inflation to be monitored at a more granular level, so the ground can be read accurately, and any pain that is felt there can be addressed promptly. The second new announcement had to do with plans to combat inflation through crowdsourcing. Mr Chan said the Government is exploring the possibility of building a platform that would allow consumers to make instant comparisons of prices at a local level, based on the data that fellow consumers provide to the system. "Supposing we can set up an area to tell people where is the cheapest coffee in Yishun, the cheapest kaya toast; and if people can access the information easily... then I think it will help consumers stretch their hard-earned dollars," he said. The idea of making prices more transparent to put pressure on businesses is not new. The Health Ministry, for example, has been publishing hospital bill sizes by procedure for each hospital to promote competition and transparency. Doing the same for basic items like coffee and toast in each town will be more challenging, but Mr Chan wants to make it possible using technology. If it can work, it will be a laudable achievement. Information asymmetry is a key reason that businesses can often get away with charging more. Furthermore, this problem affects the poorest consumers most as they have the least time, effort and means to collect the information needed to make better purchasing decisions. Forcing prices into the sunlight will no doubt be effective in killing some germs of profiteering, while easing cost of living pressure.